If you came down to this page while searching "One day in Bangkok", or "How to enjoy most in a day in Bangkok", you are at the right place. The next morning, we woke up late and missed our cab as per schedule due to last exhausted day. So we have to book personal taxi-meter to the capital city of Thailand - Bangkok and pay 1000 Thb extra. We reached All Seasons Bangkok hotel, and have our lunch there. 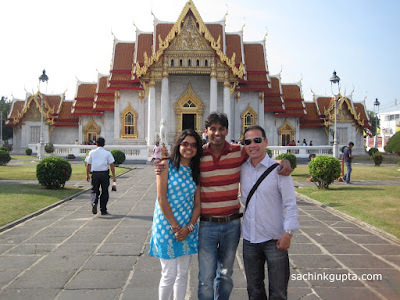 After that we have the Bangkok city tour as per our itinerary. It was heavy traffic in Bangkok (same as in Delhi). Guide keep on explaining us about the major places on the way, road system, and some random things. We got few more Indian fellows with us during today's day tour. Bangkok, the city of hundreds of Buddhist temples (Wat) have many historic places like The Royal Grand Palace, Wat Arun (The Temple of Dawn), Wat Indraviharn, Wat Phra Kaew (Temple of Emerald Buddha), Wat Benchamabophit (The Marble Temple), Wat Pho (Reclining Buddha), Wat Trimit (The Temple of Golden Buddha), Victory monument etc. 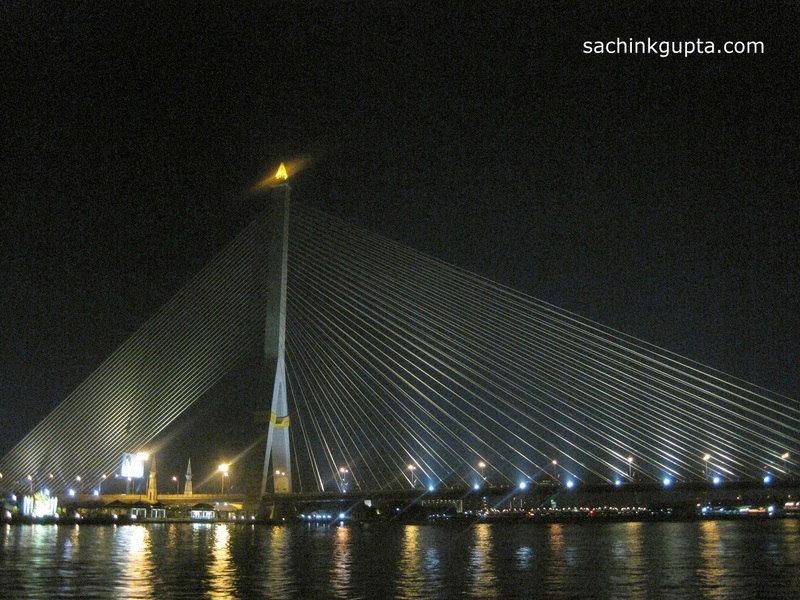 To be very frank, Just visit any two Wats, you will found most of them alike afterwards, as you can also have most famous Wats view during evening cruise. Our guide stopped us at a point, from where the glimpse of a standing big Buddha can be seen from the outside itself. It is a golden glittering 32 meters high, mirror plated statue with super-sized Buddha. Some pretty views of the surroundings can be enjoyed by climbing the stairways of supporting tower. The temple compound features the beautiful architecture and the spiritual styles, including a Chinese shrine and statues of Ramas IV and V.
There is a 20 Baht admission fee payable at the kiosk to the right of the entrance. The marble temple is named for the gleaming white marble of which it is constructed based on notable European designs. 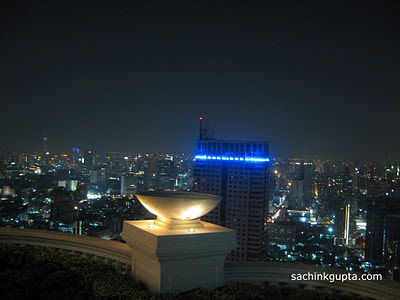 This is the most modern and one of the most beautiful of Bangkok's royal Wats. Now a days, This beautiful Thai temple is also a seat of learning for Buddhist monks with intellectual interests. Behind the cloister, there is a large Bodhi tree, bought from Bodhgaya (where the Buddha found Enlightenment) as a gift for King Chulalongkorn. Along the south side of the temple is a canal. Immediately across the canal are several interesting buildings. We enjoyed most of our times here. 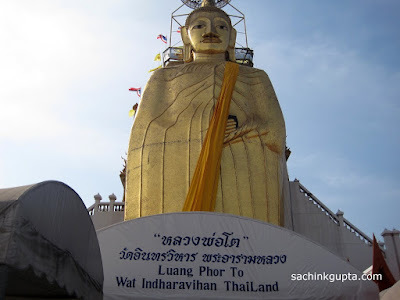 Wat Benchamabophit is an excellent place to watch religious festivals and processions. At these places (Wats), Salman-Asin starrer "Ready" movie song "Humko Pyar Hua" was also shooted. Our guide gave us the cruise tickets and drop us at River City Pier. 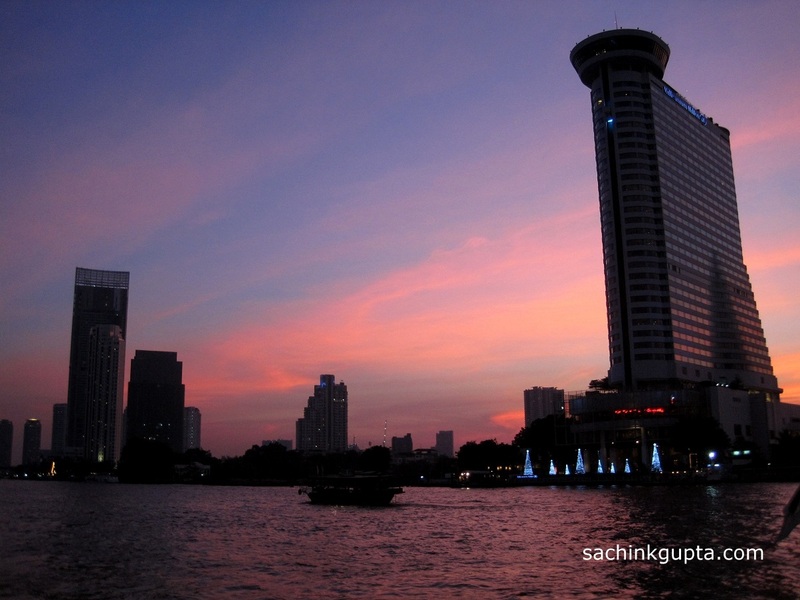 It was a perfect evening, and was fascinating to enjoy the Thai way of life along the riverbanks on a cruise trip. 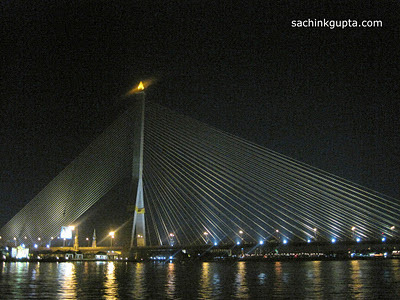 Both sides of the Chao Phraya river, the magnificent architecture and attractions are standing elegant. Along the cruise journey, just sit back and enjoy the fantastic Indian and international foods and beverages with the live music and dance. The major attractions along the way are: The Temple of Dawn, The Grand Palace, The Suspension Rama bridge, and couple of world-class waterfront hotels. We enjoyed dancing at the cruise and had many funny moments at the River City. After that we booked the taxi to State Tower that has 68 floors and is 247 m tall, making it second tallest (as of now) in Bangkok. 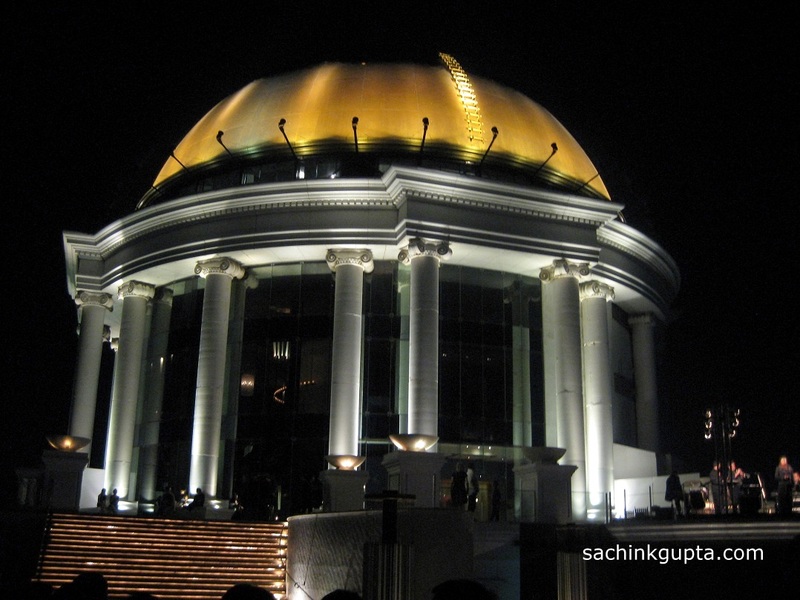 This tower is home to a five-star hotel called lebua (sic), and has forty-story high atrium inside, and on the 64th floor is Sirocco, the world's highest open-air restaurant with a spectacular panoramic view of Chao Phraya river and Bangkok city. We spent some time here and enjoyed a live band. We just get to know that Sirocco and State Tower were prominently featured in the 2011 American film "The Hangover 2". We went back to hotel by Thailand auto rickshaw called, tuk-tuk.